Apparently, Terry’s not the only one disappointed about the closure of the Madison Park trattoria, shuttered Monday. In the unexpected wake of that closure, a pal-‘o-mine reports seeing Jack and Becky Benaroya (you may know their concert hall) dining on the corner at McGilvra’s this week, and other familiar faces doing the same nearby at The Attic Alehouse & Eatery. Word had it those well-heeled patrons had been headed for Sostanza. So, what gives? And why would owner/chef Lorenzo Cianciusi bow out of his cozy Italian restaurant at the lakeside end of Madison Park so abruptly? Why leave regulars bereft and sidewalk and balcony tables empty now — when our fair-weather friend Al Fresco has finally arrived for the summer season? That sale (more about that in a subsequent post) has been in the works for six or seven months, he says, noting that while the ink’s not quite dry on the contract, it’s “95 to 96-percent there” and he had to tell his staff, then swiftly vacate the premises. 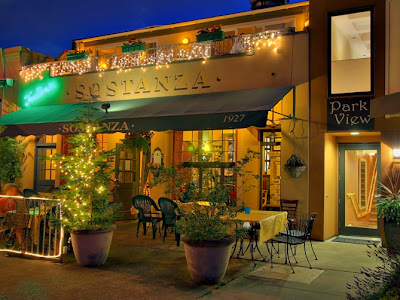 With Sostanza closed, he and his wife have plans to vacate themselves — at least temporarily. “We own property on Maui, and we’ll go over there and vacation. I’m going to decompress for a while, take it easy.” But with the restaurant business still in his blood, the chef insists he’ll be back. 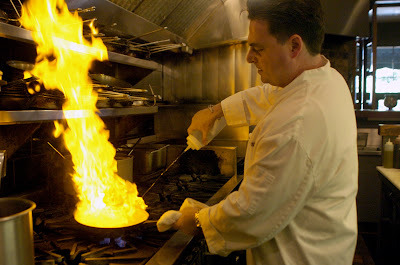 Chef Lorenzo Cianciusi at his stove at Sostanza in 2006. Take it easy, pal! I’ll miss Sostanza’s Campanella alla Veneziana, a pasta recipe Ciansiusi shared with me after my husband raved about it several years ago. And because I’m nice, I’m happy to share it with you. Buon appetito! In a 12-inch saute pan heat oil, saute onion till translucent, adding garlic at the end. Add ground beef and veal. Cook thoroughly. Deglaze the pan with red wine and beef stock. Reduce wine/stock by half. Add tomato puree, cream, fresh thyme, salt and pepper. Reduce liquid by half. Drop pasta and stir frequently. Cook until al dente. Strain in colander. Do not rinse or let sit. Add pasta to sauce. Toss and serve with grated fresh Parmesan.